House buyers often feel baffled by a mountain of information which can quickly lead to misunderstanding. Read our concise, easy to understand guide to assist you with the process of purchasing your own home. From arranging the finance to completion and moving in, we keep it simple. Arranging suitable finance is essential; we strongly advise you do this prior to searching for a property. Make an appointment with a specialist mortgage advisor; he or she will help you determine how much you need to put down for a deposit and the amount you can afford to borrow in relation to monthly repayments. Your advisor will suggest and recommend the most suitable mortgage for your particular circumstances, taking into account your present and projected income forecasts. You will receive a detailed mortgage illustration which will clarify the type of mortgage recommended, together with repayment costs, terms and conditions, including interest and any other associated charges. Once you have a mortgage agreement in place, you will feel more confident about the funds available to you when searching for property. To secure your chosen property you will need to pay a deposit. This will be deducted from the purchase price, from which the remaining balance will make up your mortgage cost. The average size of a deposit is usually between 5-10% of the purchase price. As an example, buying a £350,000 home requiring a 10% deposit would need a deposit of £35,000. On some mortgage deals, the higher your deposit, the lower the rate of interest. On the other hand, if you find a lender who is prepared to offer a 100% loan with no deposit, a higher interest may be charged due to the risk for the lender. When you are in a stable financial position and know the amount you can afford for a deposit and mortgage, it is time to begin viewing properties. Visit local estate agents, check websites, magazines and newspapers and obtain details of properties that match your criteria. Make a few notes to ask your agent about, such as the condition of the boiler and the electrics. Before making an offer, ask to see the Home report, giving you valuable information about valuation, legal documents and surveyors’ reports. When you have chosen your ideal property, ask your mortgage advisor to proceed with your loan application. They will need to make checks on your income and credit status and obtain a valuation on the property before confirming the offer agreement. Both you, and your solicitor, will receive an illustration detailing the various costs and terms. When you have chosen a property that suits your requirements, it is time to make an offer to the agent on behalf the seller. Do this in writing, and don’t forget to list any special conditions as well as showing that you are in a position to go ahead. Once your offer has been accepted, you can instruct your solicitor or licensed conveyancer to act for you. As your legal representative they will deal with all the legal formalities; these will include handling correspondence between you and the vendor, conducting ‘local searches’, submission of your mortgage application, through to exchange of contracts and completion. An experienced solicitor will act with efficiency to facilitate this process. You have a legal responsibility to adequately insure your home and most mortgage lenders insist you have buildings cover in place to protect their investment; contact an insurance company to arrange cover which should begin on the day you move into your new home. By law, you have a minimum 14-day cooling-off period during which you can cancel the policy for any reason. So if your exchange of contract falls through at the last minute, you will be protected. Cutting corners on your home insurance may save you a few pounds but it only takes one claim for a burst pipe in winter and it could cost you thousands of pounds. Shop around to get the best deal and ask about flat roofs, subsidence or other unusual features on the home. Once all checks have been completed to the satisfaction of your legal representative, he will arrange the exchange of contracts with the seller’s solicitor and payment of deposit. At this stage you are entering into a legally binding agreement to purchase. When contracts have been exchanged, a completion date can be agreed. Change of ownership for utility supplies needs to be registered, meter readings and service connections made, and removal firms contacted. 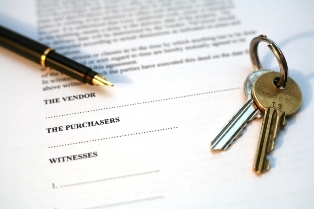 Once you have agreed this with the seller, you can arrange collection of keys to your new home. Your name will then be registered with the land registry and your solicitor will arrange for you to pay stamp duty and tax. Once this is all complete, you are ready to move into your new home. The rate of stamp duty you need to pay rises incrementally with the price you pay for the property. It works on percentage of the purchase price with a set of thresholds that take you into the next band or tier. The precise boundary for reaching a new tier is the first penny of that tier. For clarity, the figures below show how an extra penny on the purchase price will lift you into the next band of stamp duty.